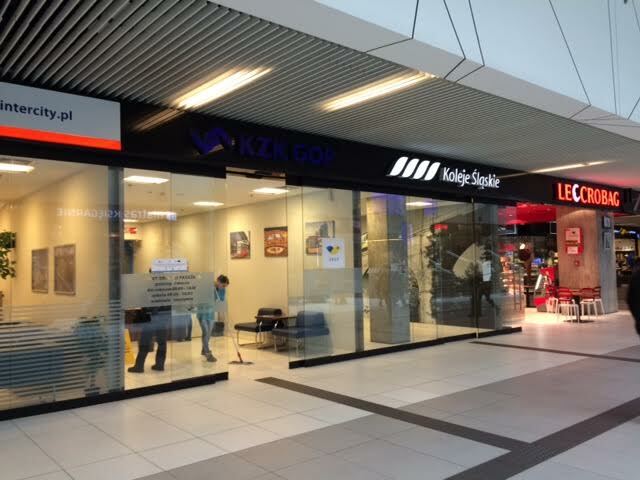 Where was the Pond in the centre of Katowice? 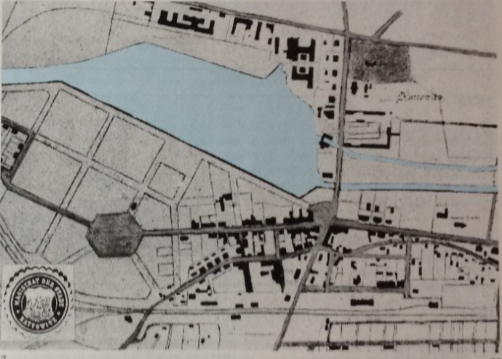 The plans of 1823, 1865 and 1893 show that there was a large pond near the centre of Katowice. But why was it there? Looking west from the Altus Building. 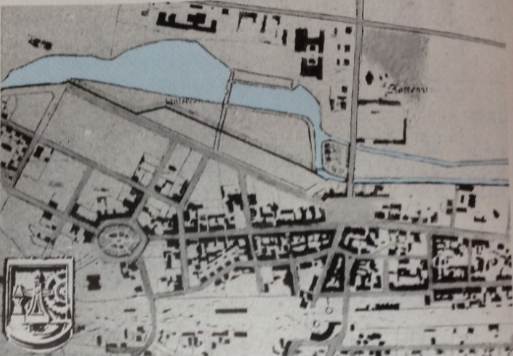 The pond would have been behind the Superjednostka (the Anthill) - the long buiding - middle to right of the picture and north of Supersam - the darker building roughly in the middle. 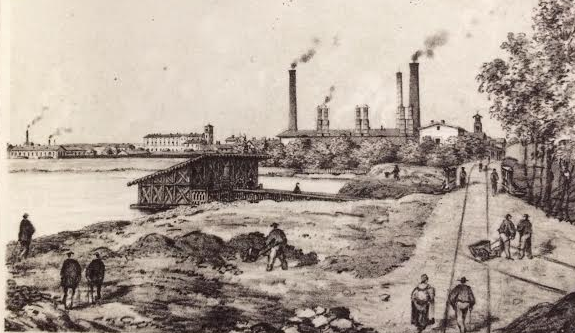 It appears that the pond was being used to supply water for Huta Marta - an iron works - from around 1852 coming from the Rawa River that runs through the centre of Katowice. But, the pond is actually a lot older as there are records showing that it also supplied a Blacksmith's Forge going back to 1397. 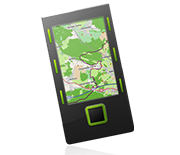 It also appears on maps in the 17th and 18th century. It would have served a dual purpose. It's likely to have been a fish pond supplying fresh fish for a Friday meal when Catholics don't eat meat. 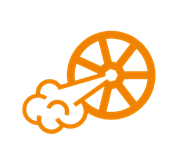 Water flowing out along the artificial canal or "leat" would have powered a waterwheel to drive bellows make the forge hotter for the Blacksmith whilst making iron tools for working on the land. Later the waterwheel would have supplied power for the Huta Marta Iron works that operated from 1852 till 1928. Around 1858 the mill appeared to have employed 80 men, 92 women and a group of children. It was making rails. 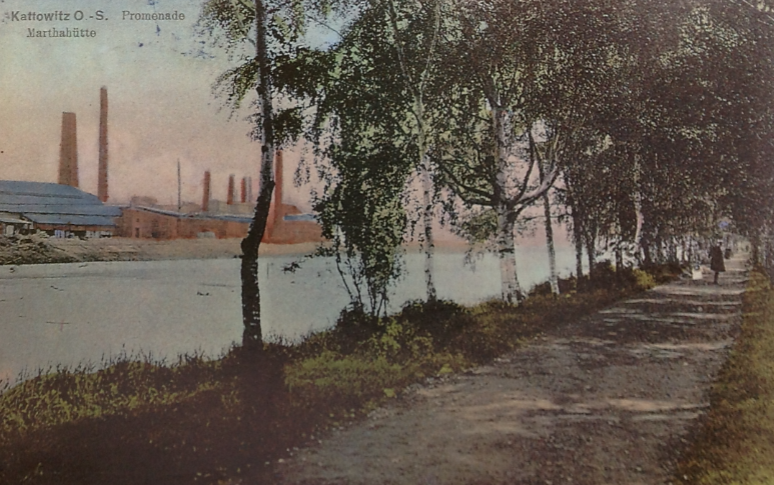 In 1892, the mill appeared to have thirty furnaces. 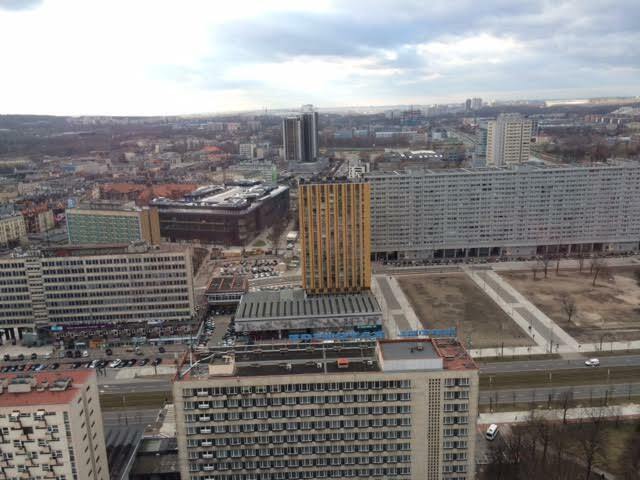 In place of Iron works, "Marta" is now a block of flats Superjednostka (locally known as the Anthill) built in the 1960s. 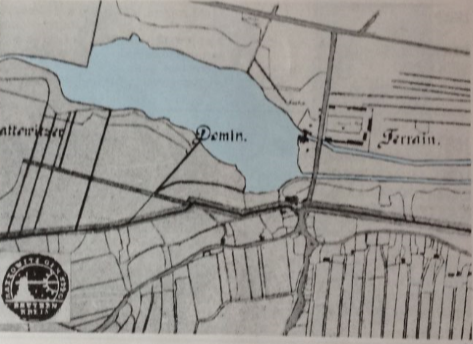 The pond appears to be west of the present day Superjednostka (Anthill) block of flats and north of the Supersam shopping centre - but it has been gradually filled in since the 1823 map. Water would have flowed in from the west and out through two outlets back to the Rawa. 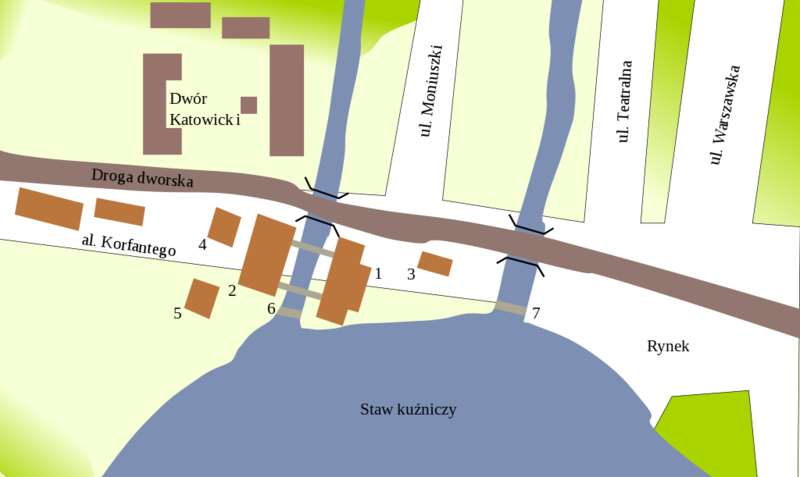 Today, the Rawa has been canalised but can be seen to the west and east of Sokolska Street, before being covered to the north of Supersam. 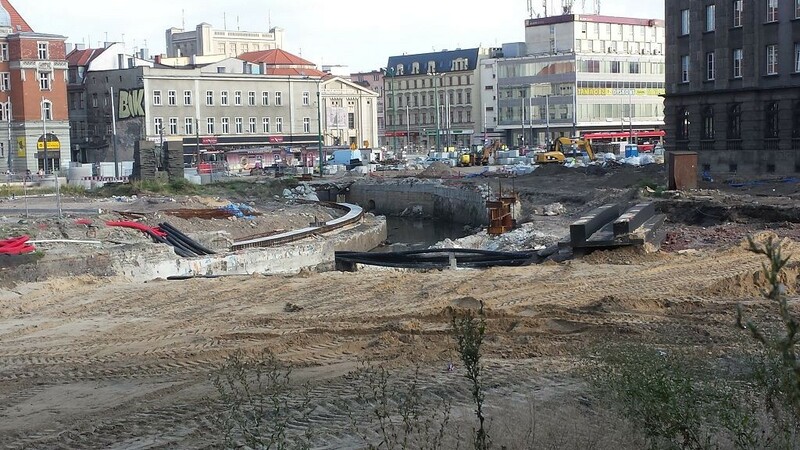 The line of the river has recently been exposed with the reconstruction of Rynek (Market Place) before it becomes fully opened again as a canalised route east of aleja Korfantego street. Interestingly, an early 20th century photograph of the Rawa river shows it having a lot more water than it currently does. In fact in 1990 when a survey was done, it was found that the river has a "water deficit" - meaning that less water left the river than went into the river. 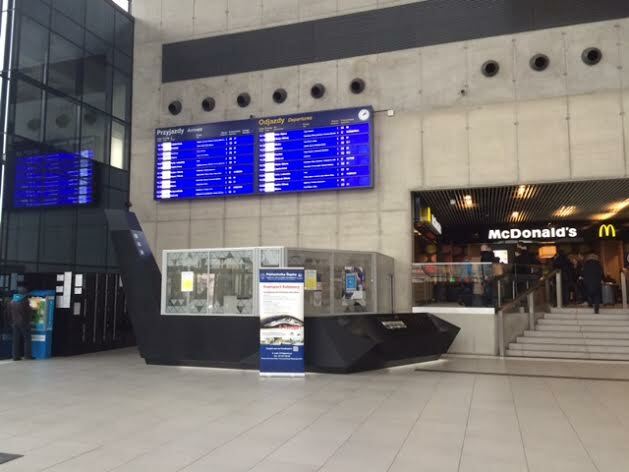 It is likely to be due to "water leakage" - loss of water into the underground mines in the area. Looking west Rawa River with Huta Marta in the distance. The buildings on the south side of the river - is where Supersam is now. 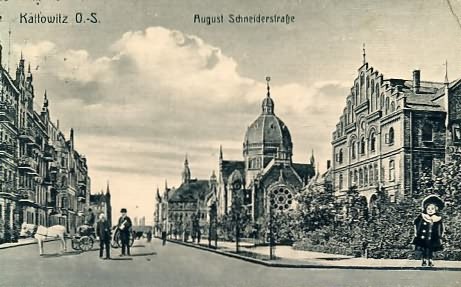 The dome building is the Jewish Synagogue, that was burnt by the Nazi Germans in 1939. after being build in 1900. 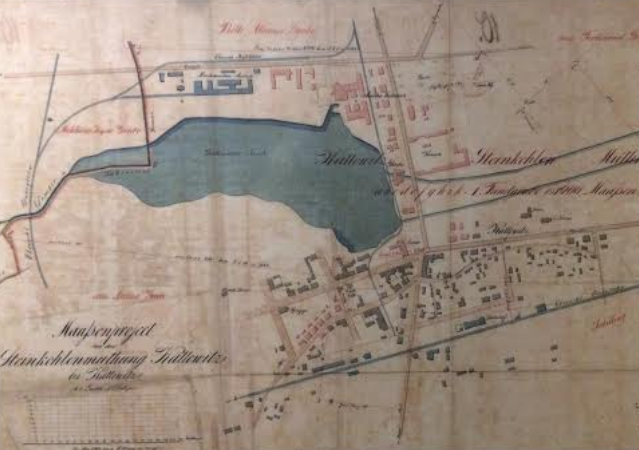 This re-drawn plan of the eastern part of the pond seems to show the northern output from the pond and suggests that water was used for the Bogucka ironworks (Kuźnica bogucka) in 1823. 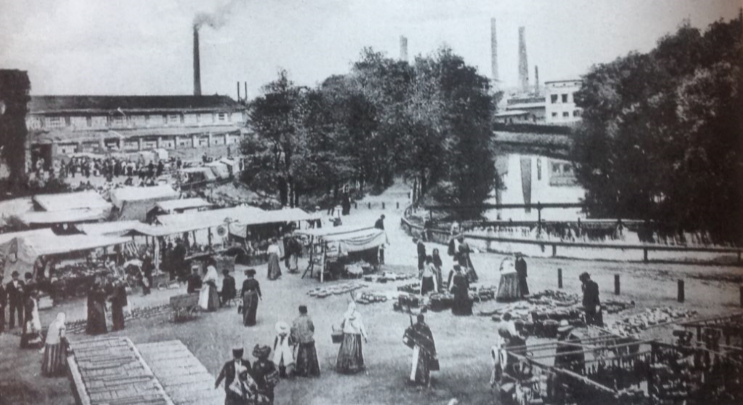 The forge pond looking south west towards 3 Maja Street (3 May Street) around 1865. 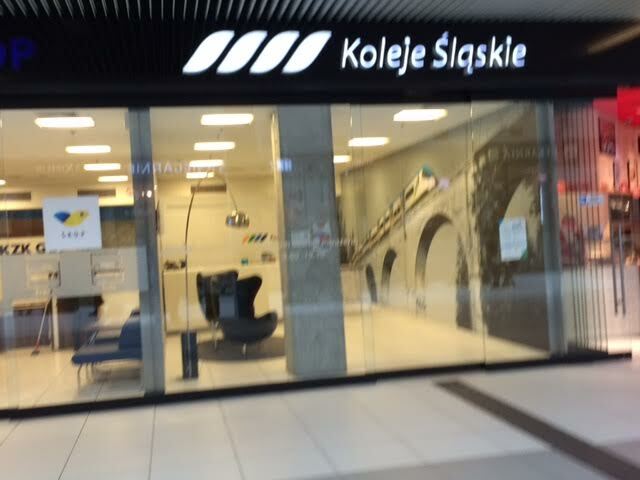 Source: The Museum of Katowice History. 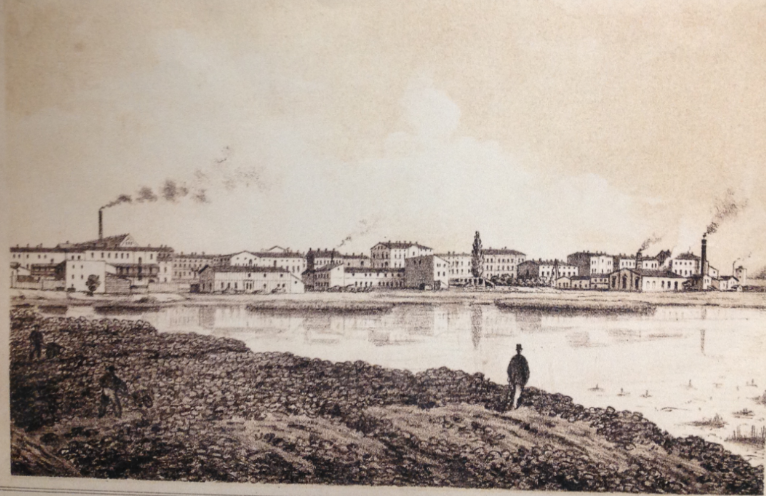 The pond in 1850 looking north east with the Zinc Works Huta Fanny on the left and a white building in the middle a manor house. Source: The Museum of Katowice History. The pond looking north towards Huta Marta Iron works. Note: the horse-drawn tramway running along the top of the dam. The dam holding back the water of the pond, also was the main route to cross the river on the trading route between Gliwice and Krakow. 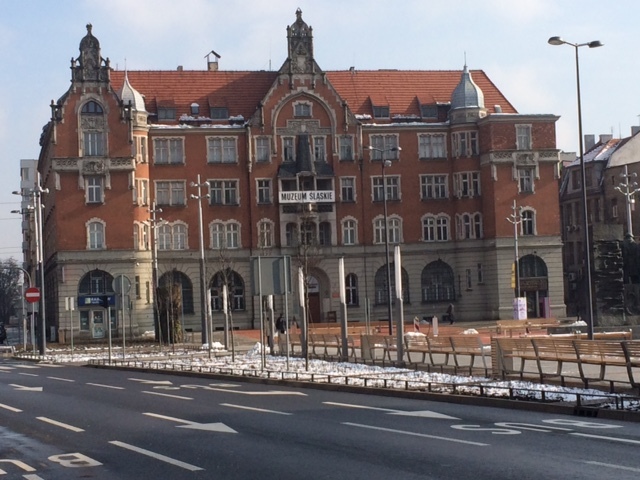 The road from Gliwice came along the northern side of the river then turned south at the present day Rondo, went along the dam, along the line of the present day Korfantego street before turning east at Rynek going in the direction of Krakow along the line of Warszawska Street. Rynek with the pond on the Rawa River and the weir. Huta Baildon Iron and Steelworks is behind the trees. The picture was probably taken at the end or the 19th or early 20th century. 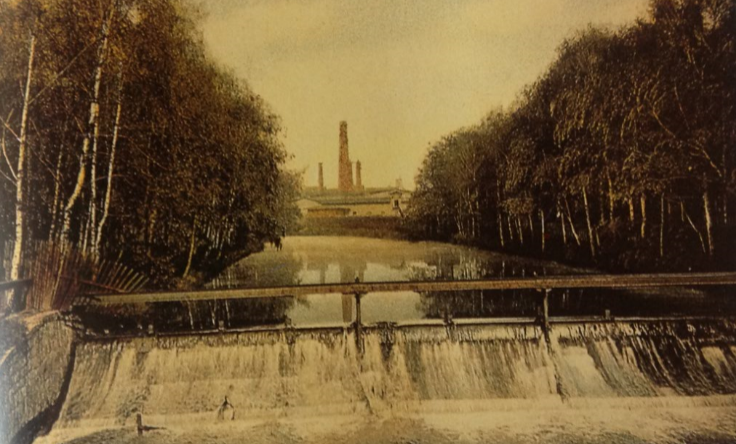 The weir (artificial waterfall) on the Rawa river, possibly early 20th century when the pond had become much narrower - but the flow of water had been increased by the introduction of weirs. Huta Baildon Iron and Steelworks is in the background. The promenade by Rawa river and pond looking east with Huta Marta on the north side. It probably was around the beginning of the 20th Century when the pond became narrower. The pond was eventually filled in during the late 1930s or early 1940s when there was a high demand for more land in the centre of Katowice. 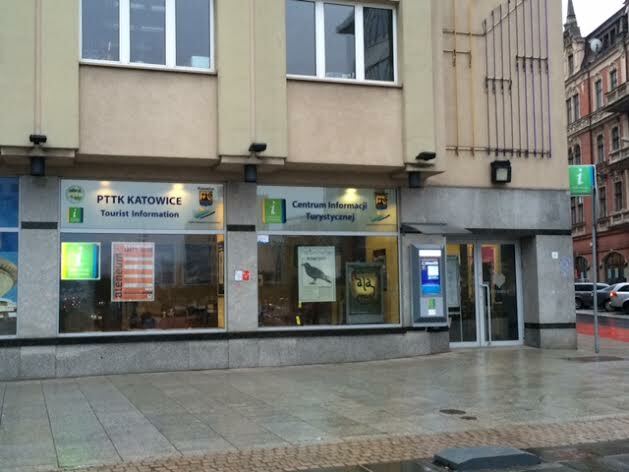 Thanks to Michał Dzióbek of The Museum of Katowice History for his assistance and comments on the writing of this article.